For years, we have been told that wild pollinators (and other insects) suffer from chemicals used in agriculture. Neonicotinoid pesticides are a particular focus of attention. We hear how plants absorb these systematic chemicals and express them in the pollen and nectar that bees feed on, with varying negative consequences for the insects (see Xerces Society: How neonicotinoids can kill bees). Scientists continue to learn more about the impacts of neonicotinoids on bees. Findings from a recently published study reveal, for example, that interaction with neonicotinoids significantly decreases the number of pollen grains a bumblebee is able to collect. 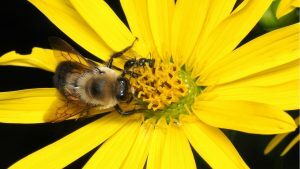 Read more here: Science Daily: Pesticides may cause bumblebees to lose their buzz, study finds. Another study makes the surprising discovery that fungicides (which do not target insects specifically, and which are apparently not very harmful to bees) also contribute to bumblebee population declines when they interact synergistically with insecticides. Read more here: Science Daily: Tumbling bumblebee populations linked to fungicides.